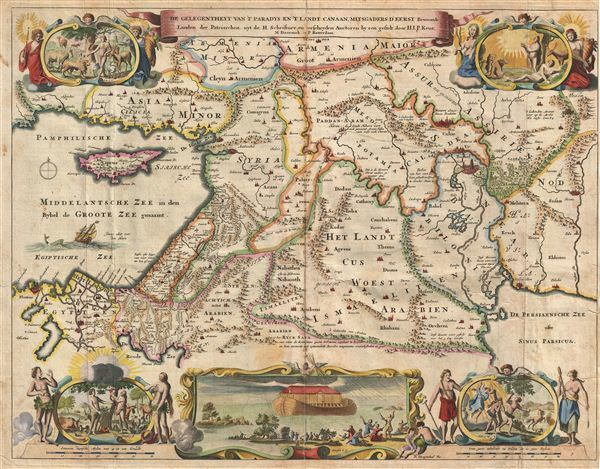 This is a splendid early example of Daniel Stoopendaal and Jacob Keur's 1702 map of the Holy Land, or as it is titled (in rough translation) 'Paradise, or the Garden of Eden, with the countries adjacent as inhabited by the Patriarchs.' Covers the region between the Mediterranean and the Persian Gulf (including the modern day regions of Israel, Palestine, Cyprus, Jordan, Lebanon, Syria, Turkey, Egypt, and Iraq), and features a prominent the Garden of Eden located near the city of Babel ( Babylon ). In the Mediterranean, a sailing ship is being confronted by Jonas's whale while inland the route taken by Jacob from Canaan to Babylon is noted. This map is derived from Nicholas Visscher's 1645 map of the same name, and though cartographically nearly identical, features updated decorative elements. These include scenes of Adam and Even in Paradise as well as Noah's Ark. In the lower right a fisherman appears to the right of the image cartouche – possibly a nod to Visscher who used the 'fisherman' iconography to represent his patrimony. Biblia, dat is De gantsche H. Schrufture, Pieter and Jacob Keur, 1702. Very good condition. Original fold lines exhibit some wear and verso reinforcement. Platemark visible. Text on verso.